PRAYER PROMPT ••• If you’re a regular reader, you know one of my major flaws. Because of my need to feel in control, I have a terrible fear of flying. Seriously, it takes A LOT to get me on a plane. Everything from a pre-flight fear of flying video; a bottle of Valium in case the plane starts to go down; relaxation music; Dramamine; ginger ale; and a paper bag for hyperventilating. When I was a kid, I flew often and enjoyed it. But a flight to Europe left me fairly scarred. I have flown since but the anxiety it creates isn’t worth it. And I mean that literally because I don’t like being the passenger in a car either. I haven’t been on a plane in 11+ years, but you know how certain sounds and smells can conjure memories? Just thinking about the sound and smell of a plane can cause me stress. It makes for some awkward conversations with my husband who wants to plan a trip to Germany. It boils down to being reluctant to put myself and my safety into the hands of someone else. I don’t surrender control very well. So when God asks me to submit to His will, I don’t always readily obey. I can make the argument that I don’t like to fly because there’s the risk of pilot error, but the same can definitely not be said of God! I may not always understand His methodology, but I know He doesn’t make mistakes. Nonetheless, submitting ourselves to His plan (when we don’t know the details or see how on earth He’s going to make it work) requires faith. If He asks us to do something, and if we believe He is who He says He is, we have to trust that He’s going to take care of us. 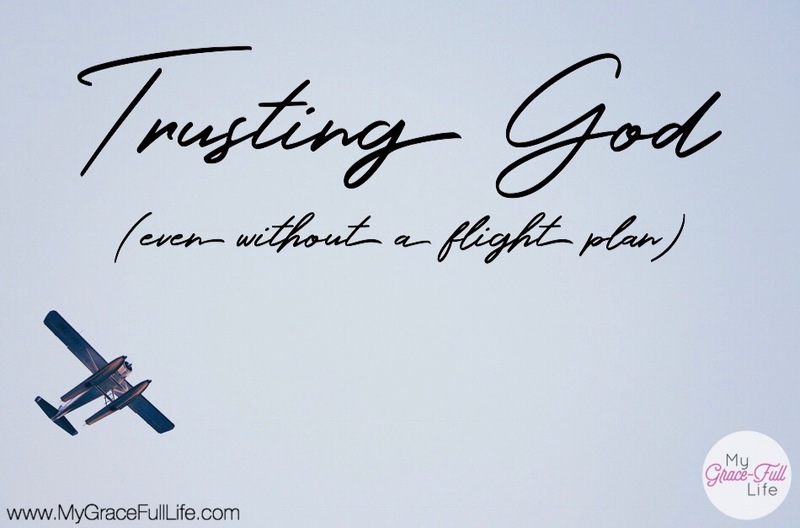 I pray that God won’t ask me to fly (that He’ll continue to use me right from my living room recliner), but if He needs me to, then I must trust Him. I may not trust the process of flying, but I do trust Him. Today, as you pray, ask Him to help you surrender control of your life, even when He hasn’t given you all the details or a flight plan. Ha, ha! We are quite a pair… you don’t like flying and I don’t like driving! 😀 This is a great application, Denise! So glad that our lives are in the Creator’s hands! ❤ and hugs!